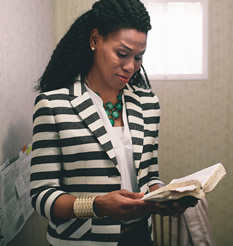 As a college freshman, Priscilla Shirer was pursuing the goal of becoming a TV news anchor — but God had other plans. The daughter of renowned Dallas pastor Dr. Tony Evans and author/speaker Lois Evans, Priscilla was familiar with living in the spotlight, and she also proved to be a gifted speaker. 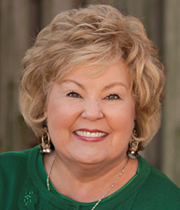 While earning her Master’s Degree in Biblical Studies at Dallas Theological Seminary, Shirer began addressing corporate audiences nationwide after becoming a speaker for the Zig Ziglar Corporation. At one of those speaking events in 1998, she met an executive for a major hotel chain, Jerry Shirer. Jerry had attended her father’s church for years, but since the church was so large, the two had never met. They began dating, were married in July 1999, and later founded Going Beyond Ministries. Partners in marriage and ministry, the Shirers are also the proud parents of three growing boys — Jackson, Jerry Jr., and Jude. Priscilla continues to speak at events around the world, and one of her greatest loves is equipping women with knowledge through expository teaching of the Bible. 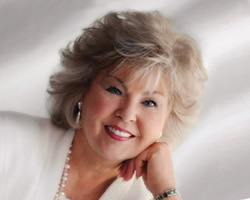 A New York Times bestselling author, she has written multiple Bible studies and numerous books including Discerning the Voice of God, God Is Able, The Resolution for Women and Fervent: A Woman’s Battle Plan for Serious, Specific and Strategic Prayer. 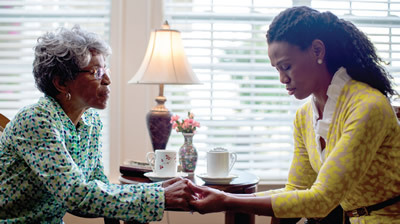 Shirer recently made her acting debut, powerfully portraying the character of Elizabeth in the Kendrick Brothers’ latest film, War Room, which released to DVD in December. A box-office sleeper hit that became the No. 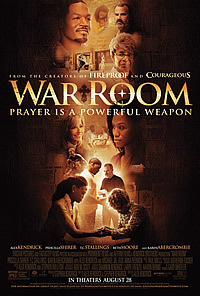 1 movie in America shortly after its theatrical release, War Room has inspired thousands of viewers — including Gloria Gaither. Gloria and Priscilla were excited to connect by phone and discuss the message behind the movie, the power of prayer, and what it means to leave a legacy that truly matters. GLORIA: Hello Priscilla! OK, I have to tell you — I remember you as a little girl. 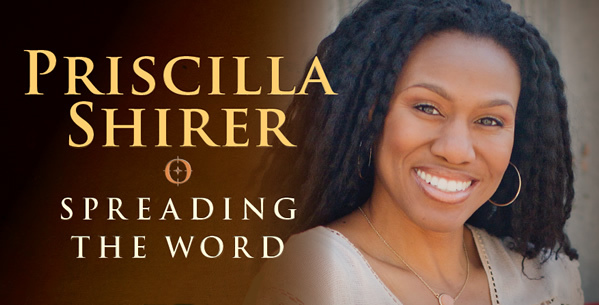 PRISCILLA SHIRER: Oh my goodness, you have no idea how excited I am to talk to you on the phone! I can’t believe over all these years, I’ve never actually met Miss Gloria face to face. PRISCILLA: Oh no, I don’t mind at all! You know what? Your kids, and then us — we have the privilege of actually having parents who have integrity, so I don’t mind when people connect me with my parents. That’s awesome! GLORIA: I think that this movie, War Room, is a great encouragement for prayer warriors, and it’s a great discussion for people who don’t know if prayer does any good. PRISCILLA: Yes, absolutely, and I think that it has brought such attention to marriage again. I have met more strangers in the mall or the airport who have gone to tears telling me about how they and their husband were basically on their way out, and it’s not completely solved yet, but they are praying together and trusting God. PRISCILLA: Bravo! I know that wasn’t a piece of cake. But the truth is, when do you do it? Just before church? Just before you get on the bus? Just before a concert? Right after a concert? The one day you have at home? You know, when? So a lot of times, I think, issues remain unresolved so long that they explode, for most of us — most marriages. OK, so I want you to talk to me about why this script attracted you. Were you in the mix from the beginning of the writing? Did you audition for casting? PRISCILLA: Well, I have such high regard for the Kendrick brothers, and that is the biggest reason I agreed to it. Their integrity and character over the long haul, with these films that they have put out … and their faithfulness — their stick-to-it-ness to the clear message of Christ and their commitment to excellence. That being said, they did call me very early on. They had just begun to put pen to paper and to think through this character of Elizabeth, who is a younger wife and mom who really does need an older woman to come alongside her and teach her how to pray. I met them when they asked me to do a small role in Courageous, and I declined at the time. It just wasn’t a good time for my kids and what was going on in their lives at school at that moment. We got to know each other a bit through that process, so they weren’t calling me as strangers, but certainly, the call to be a lead in a movie was very shocking to us. I don’t know if you’ve met the Kendrick brothers, but you should. They are some of the most delightful, humble people you will ever know! What I admire so much about them is that these movies are not a step up on their way to Hollywood. This is it—this is what God has called them to do, and they are consistent and diligent about it. And so, they asked me about this film, and they pictured me in the role as the character of a wife named Elizabeth began to develop in their minds. They sent me a partial version of the script and I just saw, again, how clearly they were going to concentrate on grace and the gospel, and the power of prayer. That just tweaked something in me, because honestly, that’s a message I’d want to share anyway if I was writing a Bible study or a book, like I’m usually doing, or standing in front of a group of women teaching. This was just going to be another way of saying the same thing. GLORIA: It’s a great pulpit, isn’t it? PRISCILLA: It sure is! And Alex Kendrick explained it to me this way. He said, “Priscilla, if you spoke on a Saturday night to a women’s group, or at church on a Sunday somewhere to a thousand people … If you did that every year in your lifetime, 52 Sundays a year, for a thousand people each time … In your entire lifetime, you would not reach as many people as this movie will reach in five years.” And the thought of that, that the Lord would allow me the privilege of being a part of such an effective, prolific way to call people to prayer — I just feel like it’s a gift that the Lord has given me. I’m very grateful. GLORIA: Well, you were powerful in it, and I felt like the casting was outstanding. Talk to me a little bit about the interaction … did you feel that meshing, when you got into the acting of it? PRISCILLA: All of us got along right off the bat, everybody that was on set, which was very important to the Kendrick brothers. When they cast everybody that was going to be in a main role in this film, they wanted to make sure that they were lovers of Christ, that prayer was not a foreign concept to them. And the reality is, Sony offered them a real actress to do my part, an actress with a recognizable name … one that would have put butts in the seats in the theaters and given them box office dollars. They declined, because they would rather have someone who actually believes in prayer. They wanted to make sure that whoever was given this platform actually believed in the power of prayer and could carry this message beyond its release in theaters. I respect them so much for that, and I think that’s why God honors their films! So there was a synergy on the set, because these were people who loved the Lord. Of course we were acting, in the sense that we had lines to learn and there were cameras to navigate and all that, but we had a common bond and a common thread immediately. GLORIA: I think even in secular films, if the people don’t like each other, I mean, you can only be a great actor or actress so far. PRISCILLA: Yeah. (Laughs) I was the novice on the set, but most other people — camera people, makeup artists — this is what they do. They do movies, so for them, this is a regular thing. Well, they were even discussing the fact that this set was so odd to them—the synergy, the kindness and, by the way, devotions. Every morning, all 100 or so of us, cast and crew, would have a call time that included time for devotions. And when there were pivotal scenes that Alex felt were going to really call someone to the carpet on the issue of possibly receiving the grace of God and salvation — powerful moments like when I’m praying the devil out of the house — he would call the entire cast and crew that were on set for a moment of prayer before we would even start filming those particular scenes. It was like being at Christian camp, and we just happened to be working 13 hours a day! (Laughs) The Kendrick brothers pastored us; they worked with us. Obviously, we had a product to make, but they actually, literally are pastors. So I felt like I was shepherded for an entire summer of filming, in my personal life and then as they helped me to see what was in me in terms of acting that I didn’t even know was there. I’m very grateful. GLORIA: Did you learn something as an actress from those that were more veterans? PRISCILLA: Oh, absolutely. Karen Abercrombie, who played Miss Clara … I don’t know if you have ever seen a picture of this woman, but she looks nothing like Miss Clara. She is the most youthful, vibrant — I don’t know, she must be 52 or 53 years old and of course, you saw on the screen how she played 70-something so masterfully. I watched the ease with which she went into the scenes … she was relaxed. She had many conversations with me about how nervous energy really comes across on the other side of the screen. The very first scene we recorded was that lukewarm coffee scene, which is obviously such a memorable one. I cried like a baby before we filmed, because I was just so nervous, but once we got going, I felt better. And I learned that from her—just the power of relaxing, and how that comes across to the viewer in the theater. GLORIA: It translates as quiet power — authority, I guess. And interestingly, isn’t that what people kept ascribing to Christ? Like, isn’t this the guy who grew up in Nazareth? He speaks with such authority! It’s that quiet peace, and you feel that power in an actor. PRISCILLA: Oh, yeah. And, I’ve come to appreciate more now how much of a craft acting really is for those who do it well. Another nugget that I learned was that listening is one of the characteristics of the best actors. So, we had to learn our lines well because you can’t truly listen to the other actor if you are trying to remember your next line. We were told to learn our lines as well as we could … there were always changes each morning to the lines, but if the general idea of the line is in you, then you can make little tweaks on the fly without having to feel stressed. That way, when the other actors talk, you can really look them in the eye and really listen to them. Because all of your responses — your facial expressions, hand movements — all of that is going to be natural because you’re really listening. GLORIA: You know, that works in every area of our lives, that our best testimony is great work. And if you never get to say a word, let your great work speak for itself whether you’re an accountant, a teacher, a pastor … it’s not in the pulpit that great pastors are made. PRISCILLA: That’s exactly right, and I see that so much again in the Lord Himself. You know, in Mark, chapter 1, He’s busy with this crowd of people wanting His attention, but then He steals away. He’s like, “No, I’ve got to go be with the Father. This is what I have to do right now; it’s my priority.” And the whole town’s looking for Him, and His disciples are wondering what He’s doing, because all these people are there and He’s been displaying His glory to them... performing miracles, and showing Himself, and the disciples think that’s exactly what He should be doing, being a showstopper. In fact, they come to Him and say, “Let’s go! The crowd’s here — let’s go!” And He says, “No, I’m going to go to Capernaum, because that’s where my father wants me to be right now.” So instead of following the whim of the crowd and trying to please everybody, going “Ta-da! Here it is!,” He just quietly goes about doing what the Director is telling Him to do and going where the Director is telling Him to go. GLORIA: It was an exercise in missing the point, and the feeding of the people was just so that their stomachs would quit growling so they could hear the sweet content of what He came to represent from the Father. And that is really true in our field, too. People that have no life except this life on stage don’t do well on stage. So if your stage life is all your life, what do you have to say to regular people? PRISCILLA: Yes, that’s exactly right. GLORIA: That’s true of you, because you have this life … you just said a while ago that you turned down a role because your kids weren’t in a good place — OK, that’s a real life. PRISCILLA: My mother and I were talking about this recently because her mother just went home to be with the Lord at 97. We spent those last days with Grandma … my mother and all of her siblings — there are seven of them — my three siblings and I, and then all of our children. We were all crowded in that little house for the last few days, just being together, lying in the bed with her, sleeping on the floor, you know — just there. And my mother and I were just saying, in the end, ministry fades, in terms of your name being in lights — all that stuff goes away. In the end, you better have cultivated a family who wants to be at your bedside. Grandkids and great-grandkids who have a legacy of faith and faithfulness because they had a grandma who made decisions and choices that were difficult, that honored God. I want to have a legacy, not because I was in a movie or I wrote all these books or I was in a magazine. I mean, if that comes with the territory of what God has called me to do, fine. But that’s not what I’m after. I want to have a legacy for these three boys that know they had a mama who was there for them, loved them, and they were raised to be men of character and integrity and that they honor God with their lives. GLORIA: You know, honestly, this piece of the conversation is the point — it’s the point of songwriting or performing in a group, it’s the point of a magazine or doing a movie, it’s the point of anything we do … there are no status jobs in the Kingdom. We just all get up and do, with everything we have, what God puts on our plate for the day. With that in mind, what do you feel the calling of this film is? PRISCILLA: I would say that the message of the movie is to remind you, number one, that there is an enemy who is not backing down in his goal to disorient and discredit and dismantle the family. I’m praying that the movie brings that back to light, but then also shows people that if he’s not backing down in his strategies against us, so then neither should we. And not only should we be consistent using the weapon that we have been given, which is prayer, but we should be strategic. Where do you see the enemy at work, or where do you expect he might want to be at work because God is doing something great in a particular area that the enemy would want to de-value? How can we be one step ahead of him, already planned, already fortified, already strengthening ourselves, our loved ones, and the body of Christ as a whole? Prayer works, and it is the weapon that can take the enemy down. GLORIA: That’s so good. Thank you for making this movie, thank you for talking to me, thank you for this powerful, strategic teaching on prayer. Bless you and thank you for your sweet spirit and lifetime of living out what you say. That is the best gift you can give any of us. PRISCILLA: Well, thank you. That means a lot to me coming from you, and I really do look forward to the day when the Lord might allow our paths to cross, so I can give you a great big hug and tell you thank you for everything you have meant to our lives.